From 75 to 100 € the night I book ! 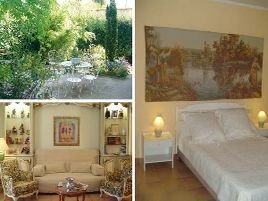 In a hilly, provençal setting, in the shade of the laurels that it is named after, guests are made welcome to this bed and breakfast in the village of Allauch. Landscaped garden. On the ground floor of the villa, the spacious, light and airy suite, offers complete independence if desired. Guests can enjoy breakfast prepared with local products in the garden in fine weather. Warm welcome from your southern hosts..
1 suite with bath, shower, WC, TV, phone and kitchenette. 80 euros (1 or 2 pers. ), 100 euros (3 or 4 pers.). The closest station is Marseille, located at 11 km. The closest airport is Marseille Provence, to 33 km.